Hip Mommies isn’t a retail store or super-cute baby brand, but chances are you’ve seen one of their eco-friendly products in a brick-and-mortar store in your ‘hood. Hip Mommies instead, is a distributor (for most brands the only Canadian distributor) of modern, thoughtfully-designed baby, toddler and pet products. 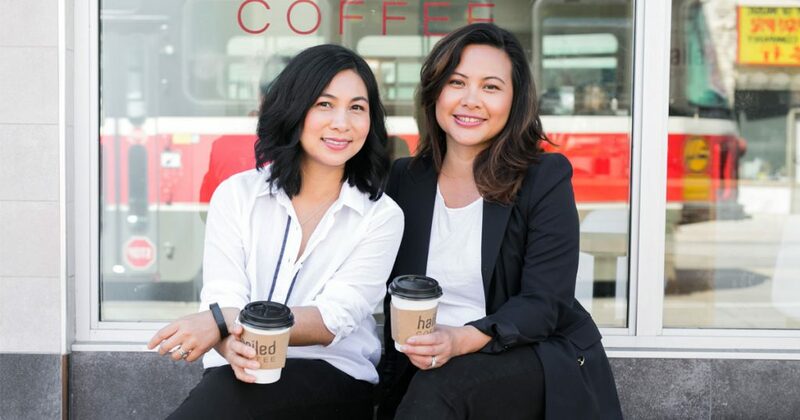 Made up of husband-and-wife team Jennifer and Joey Chua, this Toronto-based couple’s biz motto is working with brands that make quality products that are purposeful, safe and well-designed. But, that’s not all. Brands have to share the same socially responsible and environmentally friendly beliefs to even be considered. What’s even crazier is that Jennifer and Joey only work with people that they like (so strange, right?). Another belief they share is living with less. BF (before kids), both lived a minimal life while travelling through Asia. Now, being parents to 3-year old Edie, the duo have more ‘stuff’ and only keep meaningful items and well-made, multi-functional products. We chatted with Jennifer to get the goods on how she and her family live as minimal-as-possible life. The carefully curated lineup they rep includes brands such as Ezpz, Baubles + Soles, Doddle & Co., Ono and Friends and The Green Beaver, plus other local, eco-minded woman-run brands. This discerning roundup allows the couple’s small team to focus on the products they have. This loyalty extends to the foundations they support like The Down Syndrome Association of Toronto, The New Mom Project and the Canadian Woman’s Foundation. 1) How did you learn to love living with less? The one thing Jenn’s not a minimalist about is books. Her collection spans a wall of her office, along with treasured family items. 2) Were you able to continue this minimalist lifestyle when you moved to Toronto and became a mom? “I WISH. Some things I’ve relaxed on. For example, I’ve amassed a cookbook collection that is anything but minimal. We ended up renting a teeny condo at Lakeshore and Spadina, and then bought a loft conversion in Leslieville. The loft was beautiful — 100 years old, ground floor with an entire wall of windows — but it lacked storage. We maximized with custom closet built-ins and created additional cabinetry in the kitchen. For six years we were comfortable living in under 600 square feet but when our daughter was born things got crowded. It’s unavoidable (stroller in the living room! ), and not having a bedroom door was a huge issue. When our daughter was 18 months old we decided to upgrade to a small downtown semi. To me, minimalism is really more about being a conscious consumer. It is really easy these days to just click and buy and not think about our impact. Everything that I purchase I think about who made it, what resources were used and where it will end up when I am done with it. Now that I am involved in this business I understand how and where things are manufactured, and how you are being coaxed to buy things that you don’t need. So, while my house is not clutter free by any means, each item I’ve brought into the home has been carefully considered. 3) In your opinion, what items did you truly need when you became a mom? And what did you find ended up being useless? “I get asked this all the time. There are certainly some things that make things easier, especially in the newborn phase. I was adament about not needing a breastfeeding pillow and then breastfeeding was a huge challenge for us. I ended up calling a close friend late one night begging her to let me use hers. Also, a nursing bra if you are planning to breastfeed is so crucial. Another product I would recommend now that was not available at the time is the Doddle and Co. Pop pacifier that we carry. I hated having to hang on to a stash of pacifiers (natural rubber pacifiers can start to disintegrate. An SLP (Speech Language Pathologist) told me the ones with hanging toys are not good for oral development. The Doddle and Co. pacifier pops back into its own self-protective bubble when it drops, keeping things clean. It’s also 100% silicone so it’s safe and sanitary and you only have to buy one. They even double as a teether later on. Edie’s bedroom is simple yet special. “The wallpaper I purchased from jimmycricket.au — I believe it’s called woodlands (a chair rail is on her ‘to-do’ list). 4) How does this concept of ‘living with less’ factor into Hip Mommies? “We look for multipurpose goods: versatility, durability, longevity, usefulness, practicality. And if there is anything comparable on the market (we like to work with innovators, and “the originals”) and where and how the products are manufactured (ideally, they are US, CAD or EU made). You can still have responsible manufacturing in Asia, although it takes some extra steps to guarantee it. We request third-party safety testing reports, ensure all products are truly safe and nontoxic. We’ve found that copycat products (especially sold on the internet, shipping direct) are labelled BPA free, phthalates free FDA approved (etc) but they aren’t. Someone has just copied that verbiage from the original brand. We also support mom-owned business and work with good people that are giving back to the world and who are conducting business ethically. Environmental impact and social good are important to us. A mat that says it all….Another fave minimalist product is the Baubles + Soles eco-friendly, machine-washable and recyclable (and super-stylish) babe and toddler shoe (get them as a simple mary-jane style, or with twist-lock, allowing your little to swap out designs. They even make a pair for mom for those twinsie moments. 5) Are there any minimalist rules that you’ve broken now that you have a small family? Ha, so many! We are constantly being sent samples — something that I may not have purchased — and they make their way into our home. We do have a play kitchen, lots of puzzles, art supplies, a dress-up bin and a collection of well-loved books. I am conscious about what I buy for my daughter and we rely on the swap and sells and hand me downs. I am pretty selective, but in the end, I want her to benefit from open-ended and creative play, and ensure she has fun ways to express herself and learn. We keep tv and tablet to a minimum and have a rule about toys that make noise. These are usually cheap, breakable plastics. I prefer well made, nontoxic heirloom toys and wooden if possible. Jennifer and Joey’s chic, yet minimal bedroom. 6) Do you think it’s realistic for a family to live a minimalist (and we’re not talking 100% Marie Kondo here) lifestyle? I find it’s easy if you live in the city with amenities. There are many drop-in centres, indoor play places, public pools, libraries, parks filled with ride a-long toys, public concerts, farmers markets… Our public services are incredible – there are free or low-cost city run drop in programs and dance classes. There is the museum, aquarium and art galleries… We have so much to do outside of our homes that we don’t need toys in the nicer weather. The internet mom communities here are an incredible resource, too. Since many of us have very little space, we are eager to pass on children’s items as soon as the kids are finished with them. Once my little one is old enough to grasp the concept, she’ll be helping sort through her things. I think that is an important lesson. Jennifer studied Image Arts, New Media at Ryerson in Toronto — before there was a Balzac’s Coffee on site, and she treasures her collection of Balzac’s Coffee mugs that she’s picked up from the coffee shop’s various locations. “I have happy memories of being there, so I get the mug to commemorate them.” For her biz she also takes part in podcasts and forums. Most recently she contributed her thoughts to the Web Woman podcast on digital marketing and e-commerce (her episode hasn’t been released yet). The Lucky Peach and May Kaidee’s Thai Vegetarian were two books she brought back from her trips to Asia. “I bought the Lucky Peach one here — I was determined to learn some easy asian recipes for my husband and daughter that pretty much only eat asian food. I took cooking classes at May Kaidees in Chiang Mai. They are a vegetarian restaurant, and I LOVE their curries and peanut sauce!” The open book on top is a well-loved German cookbook from Jennifer’s Oma. Two of the items Jennifer brought back from her trips to Asia were NOT light: iron bookends and a doorknocker. “The iron bookends were bought at a market in Phnom Penh Cambodia. I found the door knocker at an antique market on Hong Kong island. I scoured for hours for the perfect one.” (Psst, that white blur on the left is Bodie, the family dog). Such an amazing article and Jen, always so inspirational!